← What Do I Need to Know About ABLE Accounts? Registration for this event closes on October 11 and space it limited. Don’t miss out! 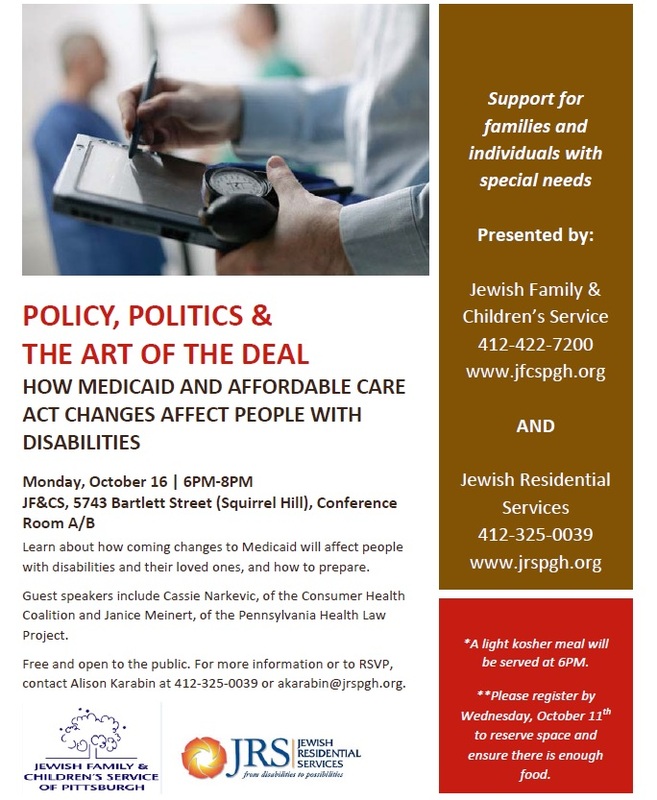 Pittsburgh, PA (September 28, 2017) In partnership with Jewish Residential Services (JRS), Jewish Family & Children’s Service (JF&CS) will host a community meeting to educate and discuss issues that affect people with disabilities as a result of changes to the Affordable Care Act (ACA) and Medicaid on Monday, October 16, 2017, from 6:00 – 8:00 p.m., at JF&CS in Squirrel Hill (5743 Bartlett Street, Pgh, 15217, 2nd Floor). “Policy, Politics, the Art of the Deal” will cover all the recent proposed changes to these two programs since President Trump was elected, including changes currently being debated in Congress. Efforts to repeal, replace and even improve the ACA, and turn Medicaid funding into a state block grant, are all possible, though no actual changes have passed Congress. Cassie Narkevic, a Certified Navigator from the Consumer Health Coalition, and Janice Meinert, a paralegal from the Pennsylvania Health Law Project will both speak on the subject and answer attendees’ questions. The Consumer Health Coalition (CHC) is a nonprofit organization dedicated to advancing health and enhancing access to quality, affordable healthcare in southwestern Pennsylvania through education, assistance and advocacy. The Pennsylvania Health Law Project (PHLP) is an organization nationally recognized for their expertise on access to healthcare for low-income consumers, the elderly and persons with disabilities. The public is invited to attend this meeting, particularly individuals with disabilities and their families, who could be profoundly affected by any or all of these changes. The program is free, but reservations are requested. Please RSVP to Alison Karabin at akarabin@jrspgh.org or call 412-325-0039 by October 11th.